I was invited to be a guest on the Show Me Your Mic podcast with Chris Enns. We talk in depth about my podcast setup, particularly the information on this page. Chris has created a great new show where he interviews podcast hosts about their gear, software and workflow. I hope you enjoy listening to Chris and I discuss my setup. All great podcasts begin with a plan. The Dr. Sci-Fi Show concept had been a swirling and formless mass which cohered over several months in late 2012. It doesn't matter how you plan our your episodes, pen and paper, Google docs, a moleskin, or a custom online system. The point is that you are moving forward. While I found Trello towards the end of my brainstorming process it has become the cornerstone of my workflow. Trello is a free project management website/app that sorts your "process" into a series of columns and cards. I love this concept because it is exactly how my brain works, and when you find a solution that mimics your mind HOLD ON TO IT! Topic Idea Pool / Host Pool --- This is my repository for every idea I have for the show. Topics I want to cover and friends and co-workers I want to interview are all tossed into this list for later sorting. I label each card with colors for guest shows, solo shows, and unpaired hosts. Scripting - Solo or Interview --- The top 3 or 4 ideas I want to pursue are moved to the second column. I am actively working on these episodes. This is where I contact the guest hosts, write the script between Carbon and Me, and gather link sources for the show notes. Recording - Interview Scheduled --- Once a show is flushed out and ready to be recorded I schedule a recording session. This takes into consideration the schedule of the guest host and the publishing calendar. The episode earns its final title but not an episode number. Publishing - Episode Number --- Just before the episode is recorded I give it an episode number and adjust the opening monolog to reflect that digit. After the file has been exported and prepared for publishing with the show blog/rss feed the Trello system is complete. The episode card is then archived for future reference. At the end of the day (or the beginning of your podcast) your microphone is the most important piece of your podcasting puzzle. I selected a Blue Snowball microphone for my show. The cost falls between a cheap Best Buy shelf mic and a pricy professional studio mic. You can find one on Amazon or Apple for around $60. Blue Microphones also offer the Yeti and Nessie desktop microphones which I highly recommend. My next mic will most likely be one of these beautiful desktop companions. I always wanted guests to be a strong part of The Dr. Sci-Fi Show. Having listened to several podcasts where Skype was used to perform out of studio interviews I decided to look for another solution. Skype seemed too unpredictable and often dropped the call during the interview. I settled on using Google Hangouts as my medium of choice. This video chat room service provides a very clear audio signal and has the added benefit of allowing you to sometimes see your guest if they have a camera equipped computer. Seeing each other helps the conversation flow naturally as you can read the body cues as well as voice tone to direct your talk. All of my show audio ends up in GarageBand, a great program which is included with every Mac. But in order to wrangle some of my audio inputs into the program I rely on two applications. Line In and Soundflower. First off, a big thank you to the SoLoMo Show for their setup article. It was a HUGE help in getting my system configured. I recommend reading their post to further understand the workings of Line In and Soundflower. Line In is a simple application for OS X to enable the soft play through of audio from input devices. You can use the program to play sound coming in through a microphone or any other device plugged in to your Sound In port. Google+ Hangouts will not output into “Soundflower (16ch)” so I export the Hangout to 2ch and use Line In to pass it on to the 16ch or 64ch which GarageBand likes. Soundflower is a system extension that allows applications to pass audio to other applications. Soundflower will take the audio from the Google Hangout and allow me to hear it through my headphones for monitoring. In the Hangout settings I select “Soundflower (2ch)” as the Output. In the Apple menu bar, I select “Built-In Output” under the Soundflower (2ch) section. This will let me hear the Google Hangout audio in my headphones. 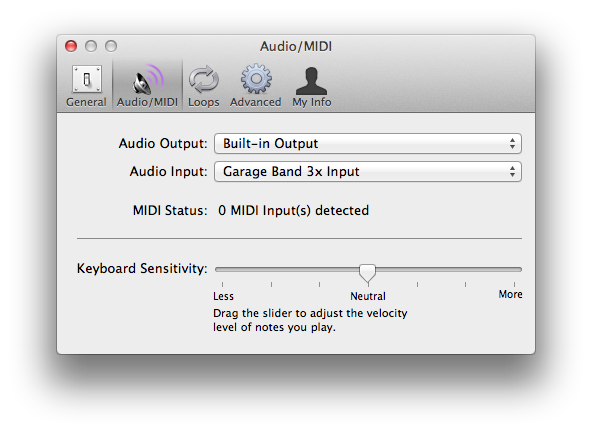 In order to record all 3 inputs into GarageBand (Blue microphone, Google Hangout, & Carbon) a new artificial input must be created in the Audio Midi Setup program (Applications>Utilities>Audio MIDI Setup). In GarageBand, this artificial input will be selected as the main audio sources, thereby allowing the three inputs to be fed into the timeline. This part is a little tricky, the whole "Artificial Input" is a little hard to grasp, but it will allow you to use all 3 inputs in GarageBand. The controls for assigning these channels into the tracks of GarageBand are located in the lower right corner. Carbon, my AI co-host is created from a workflow using 6 applications. Simplenote > Voice Over > Garage Band > Final Cut Pro > Dropbox > DJ Soundbox Pro. Individual lines for Carbon are scripted into Simplenote. I keep individual note pages for each episode, listing questions and response lines. Simplenote online syncs with the Simplenote app on my iPad mini. Using the built in Accessibility Voice Over tool on my iPad mini I record the spoken lines into Garage Band. The spoken lines are processed through effect presents and equalization to create Carbon's desired voice in Garage Band. Once the paragraph of phrases is recorded I export it to an mp3. 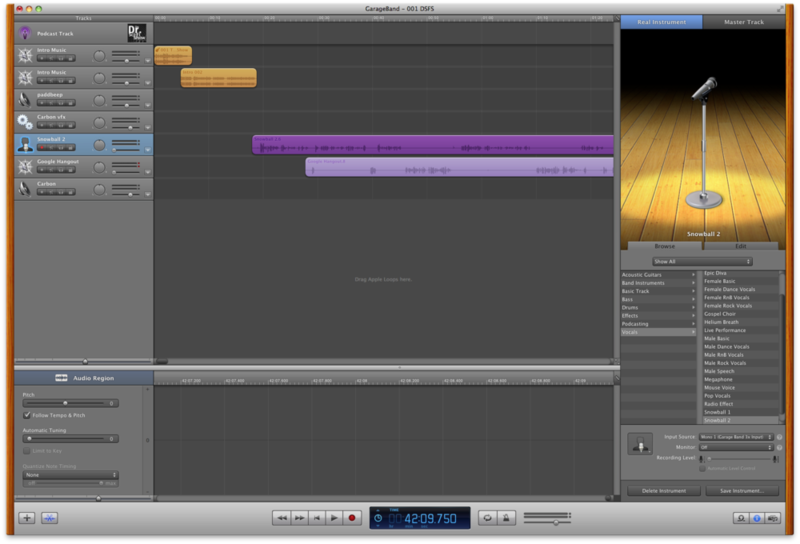 The bulk block of lines is imported in its mp3 format into Final Cut Pro. I could use Garage Band to edit and chop up this block, but I am faster manipulating the audio in FCP. These individual sound bytes are then exported into a Dropbox folder as .aif files. Dropbox serves as the transfer medium to move the sound bite .aif files to DJ Soundbox Pro. This also acts as a backup of past lines. DJ Soundbox Pro allows you to assign an .aif file to a digital sound pad. The iPad mini is then connected to the Line In port on my iMac for recording into Garage Band during the show. This way I can cue up and play Carbon's lines in real time as she responds to guests and my Sci-Fi teaching. Squarespace lets you build incredible websites. One of their key built in features is field integration for iTunes data into your RSS feed. I migrated my blog from wordpress to my Squarespace site as I can blog, podcast, and in the future open a store. All with Squarespace. Google's Feedbuner is a great web app that allows you to "burn" or process your feed through it to track how many downloads, clicks or subscriptions your feed has had. There has been some trepidation on the internet that Google may discontinue Feedburner but as of yet it still provides one of the best free subscription trackers. iTunes does not host podcasts, but it is the number 1 podcast directory in the world. The Dr. Sci-Fi Show RSS feed only took six days to be approved in the podcast store. Wait time can be between a few hours or several weeks.